The Niles Essanay Silent Film Museum. Born 6 November 1882 in Newport, Rhode Island, USA, as Thomas Harper Ince. Brother of actor John Ince; brother of actor Ralph Ince. Married actress Elinor Kershaw 19 October 1907; son, Thomas H. Ince Jr.; one other child; until Thomas’ death. Thomas H. Ince made his acting premiere on stage at age six. Ince began in films as an actor in 1905 for Edison Manufacturing Company. He began directing for Independent Moving Pictures Company, Incorporated, late in 1910 in Cuba, where he would direct short film starring Mary Pickford, Owen Moore, Ethel Grandin and others. In late 1911 he began work for the New York Motion Picture Company directing and producing, specializing in westerns and Civil War dramas. He would soon move away from film direction toward production and production management, innovating many high-efficiency production methods. Ince was responsible for the launch and development of a popular series of westerns starring William S. Hart. 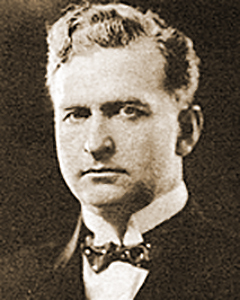 In mid-1915, Ince was among the production management staff of Triangle Film Corporation at its formation, and continued to oversee the New York Motion Picture Corporation output distributed by Triangle. Through his independent production of the feature film Civilization (1916), Ince’s industry status rose and he soon established the Thomas H. Ince Corporation. In December 1919, Ince was part of an alliance of independent producers that included Maurice Tourneur, Allan Dwan, Mack Sennett, Marshall Neilan and J. Parker Read, who established Associated Producers, Incorporated, to distribute their films after the United Artists Corporation model. The circumstances surrounding the cause of Ince’s death are a manufactured mystery. In November 1924, Thomas H. Ince was a cruise guest off the coast of southern California aboard a yacht owned by publishing magnate William Randolph Hearst. Among the other passengers were Hearst’s not-so-secret lover, actress Marion Davies, Charles Chaplin, writer Elinor Glyn, and then actress Louella Parsons. The Peter Bogdanovich motion picture The Cat’s Meow (2001) embraces the rumors and speculates that Ince was hit by a pistol shot by Hearst that was intended for a philandering Chaplin. Officially, Ince’s death certificate lists the cause of his death as heart failure, and recent scholarly research has refuted the rumors. Ince died only days after the cruise, at home, of a sudden heart attack.